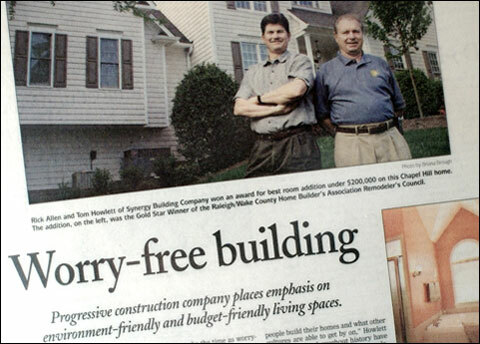 Progressive Construction Company places Emphasis on Enviroment-friendly and Budget-friendly Living Spaces By Benji Cauthren, Correspondent CARRBORO -- Some of the best houses Rick Allen and Tom Howlett build begin on cocktail napkins rather than as architect's blueprints. That's because Allen and Howlett get just as much of a kick out of the creative process as they do watching the actual bricks and mortar building. This is why they encourage customers to bring in ideas, no matter how raw they may be, even if they haven't decided on a set design for their dream home just yet. "Half of our customers come in with plans they had an architect draw up," Allen said. "The other half of our customers have a specific need, whether they need to re-do their kitchen or design a basement space. But they don't know where to start. We try to help them come up with a preliminary design in this case." Allen and Howlett have run Synergy Building Company, the Carrboro-based general contracting company that has been constructing homes in and around Orange County, since its inception in 1996. The company has built a reputation for encouraging customer involvement in all phases of the building process. Allen knows how stressful an experience this can be for most homeowners, a reason he seeks to make the time as worry-free as possible. "Typically, the less surprises for people, the better," Allen said. "There are lots of day-to-day issues in the meat of the process, and people want to know 'when will the guys show up and start banging on my wall, when is my power going to be cut off?'" Credit Allen's background in social work for his eagerness to make customers comfortable. He moved to the area from Illinois, working with the Chapel Hill Police Department before starting Synergy and later teaming up with Howlett. Howlett came to Carrboro from California, a place he credits with shaping his philosophy on construction. Howlett helped run a team of self-described "hippie contractors" in Berkeley during the 1970s who taught locals how to build their own homes. "We would go right from the classroom to the building site and start framing and putting up Sheetrock," Howlett said. "It was an effort on our part to engage people and experience housing on a visceral level." Howlett's outlook on building also was influenced by years spent living in Third World countries in Latin America, as well as Africa, Russia and India. "It gave me a global perspective of how people build their homes and what other cultures are able to get by on," Howlett said. "Cultures throughout history have been able to build their own houses relatively simply without putting themselves in debt for 30 years." Howlett has noticed trends in housing shifting toward smaller, more intimate living spaces. He said that since the tech bubble of the late 1990s burst, people are re-evaluating certain consumer-driven attitudes and shifting their behaviors as they did during the oil crisis of the 1970s. "The cost of oil is high," Howlett said. "People are thinking about downsizing and turning their homes toward the sun, and there's more focus on making high-quality and environmentally friendly and budget friendly living spaces." Allen and Howlett's emphasis on maximizing comfortable, but not necessarily massive, homes is the reason Synergy has a reputation for energy-efficient designs and employing alternative energy sources with environmentally friendly standards. Eliminating mold in crawlspaces has been the most recent effort the company has tackled. Allen says many homeowners mistakenly let in humid air that contributes to mold by attempting to recirculate fresh air in their crawlspaces. "Mold freaks people out, and rightfully so," said Allen. "The Southeast is a hot and humid place, so the conditions for mold exist." To combat the problem, Allen says they are sealing crawlspaces with bio-based foam insulation. This blocks vapor transmission between areas, and is less harmful to the environment and inhabitants of the house. Synergy also is working with a manufactured concrete product called "superior walls," which serves as an alternative to poured concrete. It allows builders to carry concrete on trucks and cranes and build a basement in as little time as one day. "It's such a quick process, and it enhances the ability to insulate for a nice, tight basement," Allen said. James Carnahan, board chair of The Village Project Inc., and member of the Planning Board for the Town of Carrboro, believes that more builders should raise awareness of the need to conserve energy and design more closely knit communities that reduce the need for automobiles.